SECUR-PAK offers a range of products adapted and/or invented for the casino, racetrack and gaming environments. As with our proven currency and cash management bags, SECUR-PAK delivers a complete security system for loss prevention for the gaming industry. 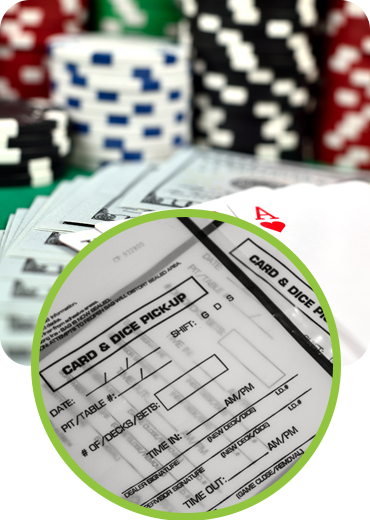 Our bags are designed for the convenient and secure pick up and transfer of cards and dice within a casino environment. When it comes to securing currency and cash, we don’t play around. That’s why our casino bags are designed with security features that make it easy to transport currency from one location to the next. This includes tamper resistant closure that seals quickly and securely without ties or heat sealers. Our clear film allows you to quickly identify the number and type of contents, with a white-on-white black strip allocated for recording essential audit trail information as well as sequential numbering and tear-off receipts. That way, you’ll know who packed, handled and received the bag every step of the way. Our bag designs have distinct features, specialized for their specific functions. Our smaller card pick-up bag is sized and printed for use with multiple sets of dice, keeping both cost and confusion low. Card bags hold up to 14 full decks of cards for transport. Learn more about our casino bags by contacting us today. CPU-2 (Card Pick-up) 6" x 9"
CAS-1014 (Card & Dice) 10" x 14"
XT-PCL-69T (Plain Clear) 6" x 9"
XT-PCL-1T (Plain Clear) 9" x 12"
HCBCL-1219R (Dual Handle Coin Bag) 12" x 19"
Quotes on custom printing, large quantities, and/or annual contracts, available on request!